A new report from the pro-abortion Guttmacher Institute, a former arm of Planned Parenthood, shows the pro-life is winning — passing more pro-life laws to stop abortions in the last three years than the previous decade. The proof is in the pudding when it comes to whether or not pro-life laws are making a difference. 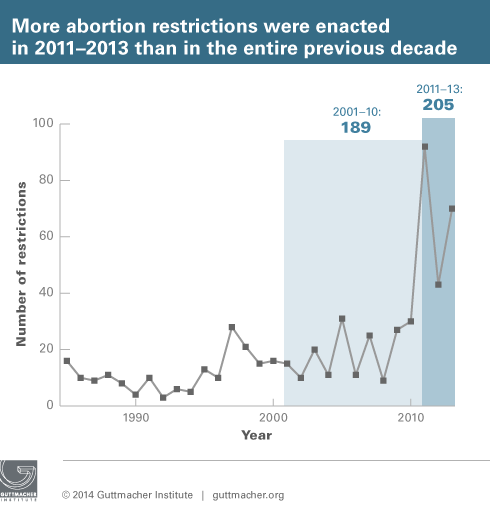 The number of abortions in states that are consistently passing more pro-life laws stopping abortions are down to historic lows — making it so abortions are down to their lowest level nationally since just after Roe v. Wade. The other consequence of passing so many pro-life laws is the number of abortion clinics and abortion practitioners is dropping each and every year. As LifeNews reported, one pro-life group documented a record number of abortion clinic closures in 2013, during which time 87 surgical abortion clinics halted abortions.